Time flies...this Sunday, Josh will going back to college to start his 3rd year in Business Studies and Joanna will be flying off to UK in two weeks time....gosh my babies will be leaving me soon and I have been cooking their favourites the last few weeks and trying to grasp as much time as I can to be together with them. I guess every Momsie will feel the same heaviness as I am feeling right now when they leave home for their further studies. Pamper them as much as I can for they will be leaving the nest soon. 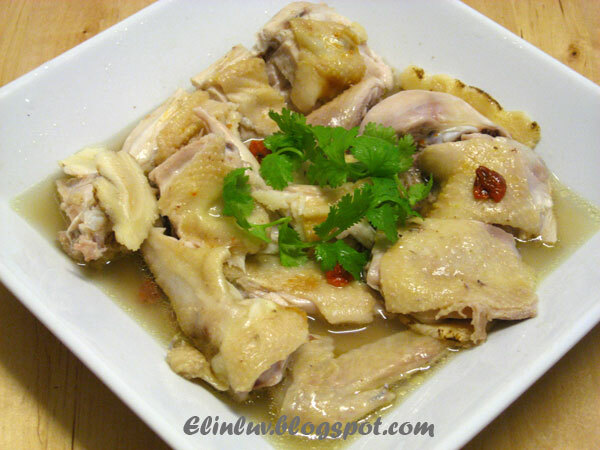 This is a delicious, aromatic and nutritious steamed chicken. Just rub salt on the chicken, add in the pieces of chinese herb - Dong Quai and a tbsp of wolfberries and a few pieces of chinese red dates. Steamed for 40 minutes under medium heat . Take out and add chinese wine or brandy to the chicken for extra flavor. 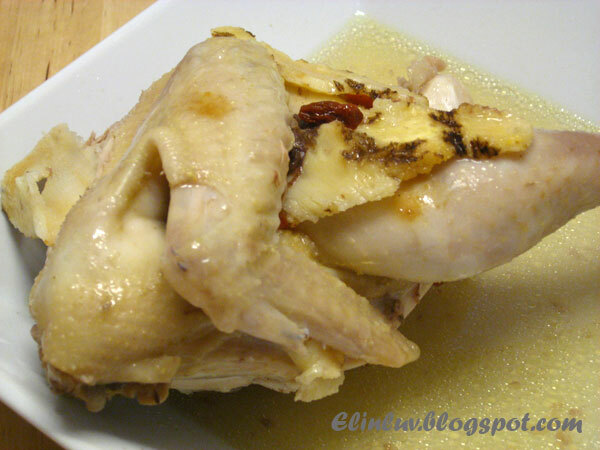 A simple and yet delicious and aromatic chicken dish that most asians will love. Rub salt all over the chicken . Place in a steamer plate . Place the Dong Quai , wolfberries, red dates on top of the chicken. Steam in hot boiling water for 40 minutes or till cooked. Take out and cut into bite size pieces . * Add brandy or cooking wine to the cut pieces before serving. My parents must had felt the same way as you are feeling right now, when I left home to study. Oh gosh, some day it will be my turn to feel this way. Not too long to come, about 5 years from now. But time flies fast and sooner the 5 years will be right in front of me and have to let my child leaves.Funnily, of late, I've been thinking the day when my child leaving me and even thinking of moving to whatever country he is going to go to study. Oh my,I'm missing my baby already! Oh Elin, I think you going to miss your piggy girl dearly! I still remember when i went off to NZ, I saw my mom crying at the airport! I don't even dare to turn my head back to see her. But I called her! You is much better, at least you guys can stay connected through blogging or email! Make sure she brings along enough clothings. Hope you have a fabulous weekend with your family! My mum used to cook this a lot before I came to the UK too. Love it and I still cook this very often now. ohhhhhhhhhh I am sure you are going to miss Joanna. I know how you feel being so far from her. You know, I never allows my mom to see me fly off each time I went back home. If she started to cry I will do the same too. But after so many years it makes leaving a bit easier. I felt the same way too when my kids left for further studies, one by one. Nowadays I feel uncomfortable whenever I send them off at KLIA, after their holidays here. Just need to tell myself that's life! Hi Elin, Thank you for reminding me of such wonderful homey dish! This is one of my favorite but never made for myself and yet so very simple. Can't wait to share this with my sisters!!! Hi Elin! I just wanted to let you know what I'd like to pass on this Sunshine Award to you. I like you blog and it has inspired me in some way of life. I hope you enjoy it. Btw, the chicken looks so good!! I like this too, really delicious ! Hi Elin, Your chicken looks delicious. I almost bought one today when I was walking through the Korean market to make soy sauce chicken...but I didn't. Now I think I'd like to try wolfberries (I had to Google this one) and the herbs instead. I still have 18 years to go before my baby flees the nest for college but my heart aches already! I feel your pain, but also your pride. :) Thanks for sharing. Ashley...I guess all moms will feel the same way, when their kids leave home for further studies whether in or out of the country :) If we hve the $ I also don't mind moving to whatever country they are going to :) Spend more time with your baby...5 years will just fly by in a wink of an eye. Kristy....ohhhh yess a lot. I am already crying every morning the moment I open my eyes. 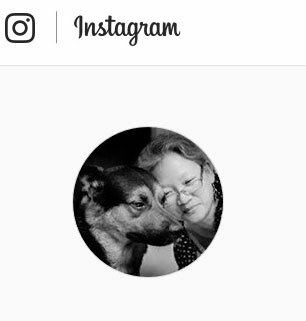 I dread to send her off on June 5th :( Thanks for comforting me. I need your support thru our blogs :))) loneliness will creeps in soon. I would like to boil some herbal soup for my children as well but have no idea what are the non-heaty but healthy soup. Mind to share your herbal soup recipes? 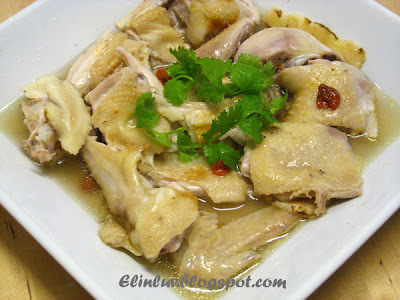 Hi Lyn...I boil the simple and common one with the chinese herbs - yuk chok, kei chi, thong sum and red dates with free range chicken for the whole family. For my gal I double boiled half a free range chicken with 'dong quai' and black dates and at times with ' pau sum ' slices . At times I just double boil free range chicken with a bowl of hot water for 4 hours for one person. You will definitely miss the children but most important is they always have you in their hearts. It's good with some DOM, right? Nutritious and delicious. I like it. 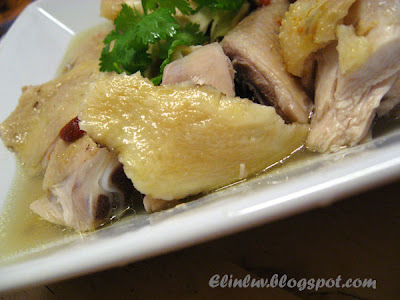 I haven't had this tonifying herbal chicken for ages....looks very yummy! I am sure your kids will miss you too. When they can't get Dong Quai easily while overseas, this dish will definitely come to mind. Angie...ohhh you can't get dong quai over there in Germany ?? Yes, this is the dish I'd go for seconds and thirds ... It's steamed. Now, that's what I call "healthy" and "easy." Thanks for sharing the dish with us! I am coming to Kl at the begining of july and especially for durian. i remember geting some dong quai chicken delivered by a takaway place in KL. I dont remember the place but the delivery guy had a motor bike like the pizza delivery guys. I've searched the net but couldn't find them. if you could help much appreciated. And i will try your recipe for the dong quai chicken.